Kritiklabbet is an initiative by and for critics in all art forms, that seeks to experiment with the aesthetic, technical and economic elements of new critical practices in the digital era. The lab came into being as an expression of the need for somewhere to elaborate solutions to the challenges that are facing our field. For this end, we secured funding for two years from a Swedish media company, Bonniers, starting in the spring of 2016. As in many other countries, Swedish critics are experiencing a net decrease in their incomes due to a range of economic and cultural changes brought about by the digital shift. Rather than approaching this new order with conservative antagonism, we wanted to investigate how we could interact with it to provide a future for professional criticism. A weekly newsletter with poetry criticism, built to combine the economy of attention with serious and in-depth, as well as well paid, writing on poetry. All the material is free and part-funded by advertisement and part by public subsidies. The newsletter reaches 6500 readers every week, and is created and run by Magnus William-Olsson, who also initiated the idea of Kritiklabbet. The “School of Spectator” is an initiative inspired by the Escuela de espectadores that started in Buenos Aires, with the aim to create a conversation between three parts: the audience, professionals and a critic. These conversations take place, usually, some days after the performance and the critic is there to facilitate the discussion between the audience and the theatre by introducing the event and then steering the interaction towards an exploration of artistic choices. It has been staged at various theatres around Sweden and is financed by the participating institutions. We have carried out a number of workshops for people with little or no prior experience of writing criticism. A number of these has focused on dance criticism led by Axel Andersson and Danjel Andersson under the name of “Koreografikritikverkstad”. The concept utilizes “task” to force the participants, including the leaders, to write reviews with certain constrictions, loosely based on Ouilpo tactics. The dance workshops have also been carried out in Norway and Denmark. We have also developed a similar set-up focusing on minority literatures and languages in Sweden, where participants from diaspora groups read literature from the same group and write about it in Swedish. Since its opening, Booksa has hosted more than 500 Croatian and foreign writers at readings, book promotions, public discussion as well as many literary festivals such as Festival of European Short Story, Festival of Latin American Literature, International Festival of Contemporary Poetry Brutal, International Poetry Festival Goran’s Spring etc. It has organized its own annual festival Review of Small Literatures since 2005 which presented more than 100 writers from 16 European countries. The club has more than 14.000 members. Booksa is a member of the European platform of literary festivals and venues Literary Europe Live. “Education of young critics – Criticize This!” was a trans-national educational project for young art critics which aimed to promote contemporary art production by revitalizing art criticism in the media, create a trans-national educational platform for art criticism, promote contemporary art and contribute to recreation of the common cultural space in the Balkan region. Through activities young art critics from Croatia, Bosnia and Herzegovina, Serbia and Montenegro gained skills to review art works from another country within the framework of three themes: dealing with the past, identity and social transformation. The project was created in partnership with Kurziv, Plima Association and SEECult.org. Translocal Institute for Contemporary Art is an independent centre for transnational research that operates across the disciplinary boundaries of art history, contemporary art and ecological thought with a focus on the art and visual culture of Central and Eastern Europe. Working in collaboration with universities, museums and non-profit spaces, Translocal is active in the fields of art history, art theory, curating, art criticism and teaching, as well as through the realisation of seminars, conferences, exhibitions, art projects, excursions and publications. ECOhUMANITIES is an online platform of the Environmental Arts and Humanities Initiative for academic researchers, cultural practitioners and ecological activists working at the intersection between scientific and humanities-based approaches to the environment, with a particular focus on the role of artists, curators, filmmakers, architects, writers and theorists in creatively negotiating planetary issues. It responds to the demand in the Anthropocene for new intellectual and cultural approaches that combine a natural and social-scientific understanding of Earth systems with the knowledge and values of the arts and humanities. 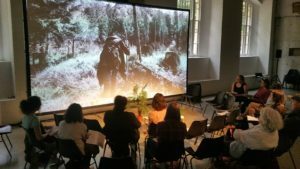 The Experimental Reading Room is a three-day participatory seminar space led by The Translocal Institute for Contemporary Art, with the aims to create a space to interact, experiment, learn and dream towards ecological awareness in contemporary art and society. The readings, artworks and collaborative activities of the session deal with the far-reaching implications of the geological concept of the Anthropocene for the intertwined fields of science, the humanities and the visual arts. Domain for Art Criticism has supported a criticism of the future since 2004. We stand for reassessing and enriching of independent reflection on art. We see ourselves as the driving force within media networks, studies and cultural organizations, wanting to work for in-depth and broadly focused conversation about art. We offer thinkers and writers a chance to explore their talent. Our working field incorporates all possible art disciplines such as dance, theatre, music, visual art film, architecture and literature. The cultural sciences research training group “Cultures of Critique” of Leuphana University undertakes a productive revision of the preconditions, roles and validity claims of critique. On the one hand, new technologies and distribution channels have given rise to a welter of unexpected critical and quasi-critical practices. On the other hand, the very theoretical foundations of critique have come under massive pressure – and so, it seems, has the modern project of critique as a whole. What may be regarded as an act of critique and which agents, expectations and criteria take part, is currently subject to basal negotiation. The Research Training Group “Cultures of Critique” connects researchers whose PhD and postdoctoral projects address “critique”, its present conditions and possibilities, from different angles. We meet weekly to discuss our research projects and overarching theoretical approaches to critique. Together, we organize workshops and an international conference (June 2018). Three of our PhD projects are concerned with art criticism. “From Where I Stand” is a collaboration of Laura Kowalewski, Oona Lochner, and Isabel Mehl, all PhD researchers at “Cultures of Critique”. It was founded in 2016 to reflect on the present possibilities of feminist art writing: art criticism, academic writing, and beyond. Our main project so far is a workshop series that invites art historians, critics, curators, and artists, whose work relates to feminist practices, particularly. We also speak, write, and publish collaboratively. The Competence Centre Management Culture & Policy, specializes in different types of management and policy research of the cultural and creative sectors. Recent research topics are: management of heritage depots, international cultural policy, cultural diversity, cultural governance, opportunities for public private partnerships, residency policy, the impact of subsidies on the artist and artistic organizations and creative cities. We organise a master’s programme in cultural management, and several research projects, publications and events. At the request of Folio, the new platform for cultural, literary and heritage journals in flanders, the Antwerp Management School (Prof. Annick Schramme and Joke Schrauwen) set up a reflection on the future of literary cultural and heritage magazines in Flanders. With this research project, we strive to map the magazine landscape in all its diversity, but above all, to research the joint challenges for the future.